Eynat Don is the incredible photographer of the above photos. I met her this past Spring when she invited me over for tea and a shoot of myself and my newborn baby boy. I was thrilled because I didn’t have any professional photos of my other kids when they were infants…and I was already well aware of how those precious few months of infancy go by in a blink. Eynat’s studio is in her home and she works wonders there, capturing spontaneous moments that are intimate and so real – you can almost relive them. Isn’t that what good photos are all about? She made me feel comfortable and I fell in love instantly with her warm and quirky personality. She was 9 months pregnant then and climbing chairs and tables…anything for a good shot. By the time I got home from our session, I already had a beautifully designed postcard waiting for me in my inbox – a collage of the best photos from the morning! Incredible photos. Her post cards can be used for holiday greetings or just to share your moments with family and friends. Eynat also designs beautiful photo books for families and special occasions. A session with Eynat is perfect for family, babies, pregnancy and event photography. Eynat also takes great business portraits. A business portrait session ($75) was a great gift for my husband for Father’s Day and the results were superb. Professional photography is often an indulgence but Eynat’s prices are so reasonable and turn out time is rather quick. A session costs only $200 and includes all of the photographs on a CD for you to keep. This means that you can print any time and anywhere. Mamapicks readers, when booking your session, you will receive four 8×10 OR five 5×7 complimentary prints! You can check out Eynat Don Photography or contact her directly here. Life is so busy that sometimes it’s hard to find time for taking care of ourselves – for me, the 2 minutes it takes to remove my mascara sometimes proves too much when all I want to do is go to bed already. But lately, I’ve been looking in the mirror and really…it’s time to work a little harder, feed the skin, make sure that those fine lines are not entirely my fault. When my friend gave me a series of Arbonne products to try, I was so happy. This came just in time as I was making a personal resolution to take better care of myself and to make it a priority to indulge in something other than Nuttella. I tried the skin care line as well as the line of skin care for babies/kids and loved it. The skin products are very luxurious and I especially enjoyed the eye cream. My skin felt more supple and hydrated within a very short time. I read a bit about the formulas and was happy to find that Arbonne stays away from harmful ingredients such as PABAs and the company is committed to designing products that are botanically based and not tested on animals. The baby products went a long way in my house – especially since I am trying to expose my children’s skin to products that are safer. The Boy (4), has very sensitive skin and always reacts to sunscreen. Arbonne’s delicate sunscreen won me over when I tried it on him and saw no reaction. I also tried the baby oil on The Baby…and it is by far, the silkiest baby oil I have ever used. I ordered the whole baby line! If you would like to try the products, there is a great way to do so with your family and friends. You can host a beauty workshop for 5 people and receive $120 worth of products. As well, for the next month, Mamapicks readers receive 35% off the Arbonne baby line! You can contact Lital at 416-999-3255 or send her an e-mail. If you live downtown, you can contact Sharon. Just say Mamapicks and enjoy! Posted in Cool Products, Deals, Exclusive Discounts, Gifts. Hairless. Can you imagine a summer without a razor or waxing appointment? Sounds like complete freedom to me. This mama has taken the plunge and started IPL hair removal. As always, I ask friends, do some research and all this brought me to The Body Health Spa and Treatment Centre. It is not a regular relaxation spa, it is a centre that offers a wide selection of non-surgical treatments for both men and woman of all ages. These include special facials, cellulite treatments, body wraps….and of course, IPL hair removal. The spa is new, immaculate and relaxing with knowledgeable and friendly staff. Upstairs you will see a teaching area – the fact that this spa trains staff from other spas made me feel really good 🙂 The technician took the time to explain all of the details of the treatment to me with great patience. The treatment itself was PAINLESS. It is difficult for me to explain the sensation but there was definitely no pain involved (believe me, I was ready for pain and was even told by friends to use skin numbing cream!). I can’t wait for my next session and to be hairless by next summer. Prices are really reasonable and Mamapicks readers receive an additional 20% off! Posted in Exclusive Discounts, Useful Info. There is nothing like a good cut or style to make a mama feel amazing… and there is nothing like a good deal to help us justify spending money on looking good. Lena is an incredible stylist who works at the Finishing Touch Salon near Centre & Dufferin. She is offering first-time clients an unbelievable price on Tuesday & Wednesday appointments. $15 for a blow-dry and $35 for cut+blow dry. Trust me, she is incredible and you’ll be back for more! Just tell her that you are a Mamapicks reader. Posted in Deals, Exclusive Discounts. I am madly in love with this print. Partly because seeing yellow makes me feel happy on gray Fall days…and also because I want my girl to always know that she is my sunshine. 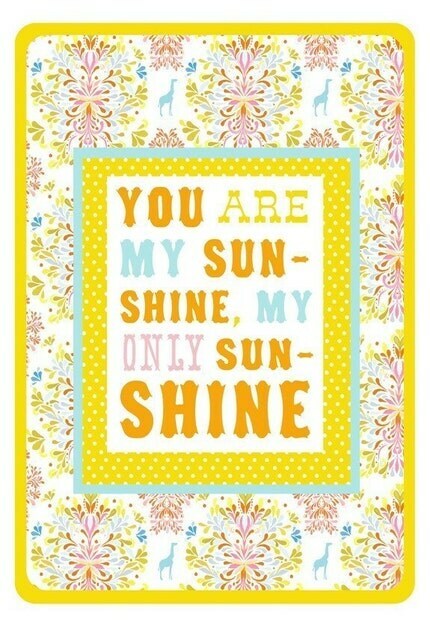 A beautiful addition to any girl’s room with the warmest message of love. Created by the talented illustrator, Katie Lombardo. Katie is offering this print to Mamapicks readers for a very special price of $15 + free shipping (prints are normally $20 + shipping). Choose “reserved for Mamapicks readers” to order and if you are asked, mention the promo code Mamapicks in the notes to seller section. You can order as many as you like! Posted in Cool Products, Decor, Exclusive Discounts, Gifts. A good friend bought my kids one of these personalized CDs and they just love listening to it! The songs are popular and catchy and kids love hearing their name. The CDs now have a new feature – you can record a personal audio introduction that the child can listen to time and time again. This is perfect for family and friends who are far away… Receive 20% off your next order by entering code MAMAPICKS in the discount code box on the website. Expires Nove. 20th. Posted in Cool Products, Exclusive Discounts, Gifts, Personalized. 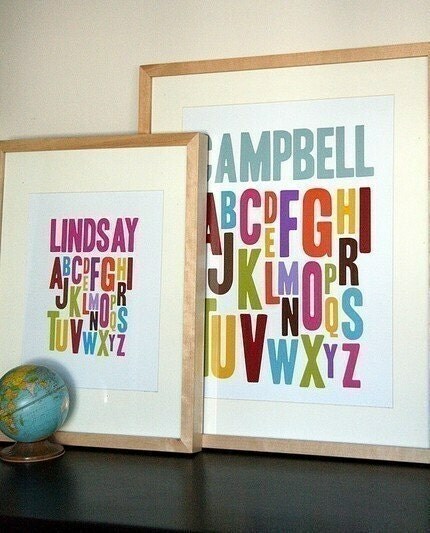 All the way from New Zealand, come these truly irresistible custom made names to complete your nursery. Ten colours to choose from and a gorgeous retro font. I am absolutely in love! Angie is a mom (and she is really nice). Two years ago, after bringing her first baby home, her husband created one of these for the baby’s nursery and that’s how Fudge Designs began. Guess what? Mamapicks readers receive 25% off their order! Please keep in mind that the website is in New Zealand dollars, NOT US dollars! For example, a 4-letter name including shipping to Canada costs approximately $56 US after the Mamapicks discount (including shipping!). What a great gift this would make. Promo code: MAMAPICKS, valid until October 31st. Exclusive Mamapicks Discount on Mittens From Honeybunch! Clips sewn right into the cuff! Honeybunch (my favourite online shop), is offering Mamapicks readers a special discount of 15% off ! Promo Code: mamapicks. Valid until Oct. 20th. If you’d like to visit the beautiful store, Honeybunch Homestore for Kids is located at 3885 Bloor Street West in Etobicoke. This little store is so gorgeous, I could spend hours browsing all of the unique stuff. Since it’s a little far from where I live, I visit the online shop often to see what’s new and exciting! Free Weekly Story Time @ Klim School of Art + Exclusive Discount! Free Story Time for ages 2-5 takes place every Wednesday @ 1:30pm throughout the month of October. Your child does not need to be enrolled in order to enjoy this free activity. Come on over to hear exciting and interactive tales about mythical creatures, far away lands, and much more. Mom & Tots Class is a new introductory art course for ages 2-3 yrs. Children will learn basic art skills, create using a variety of media and age-appropriate tools, play games, sing songs and have a great time. Mamapicks readers receive 10% off when registering for any program! The discount also applies to Klim’s great P.A. Day programs. Offer valid until Friday, Oct. 9th. Posted in Activities & Events, Exclusive Discounts, Useful Info. My favourite go-to for gifts is You Name It Baby. This online store has everything from personalized artwork to clothing and you’ll enjoy looking through their selection. What I love most are their personalized lunchboxes and bags. If you are looking for a really unique gift, I recommend the snack box for baby…new moms love it. Toddlers and their parents will adore a lunchbox or backpack with the child’s name on it. For older kids, you will find a duffel, laundry bag or even a wallet. Ranging from $18-35, you can easily find a great gift that both parents and kids will value without going beyond your budget. If your little ones go to school, you probably spend a large part of your weekends at birthday parties for kids you hardly know. If you are on a budget but still want to buy something special, You Name It Baby‘s Crayon Keeper is sure to be a hit. I just ordered three for upcoming birthdays! $9.99 each plus $5 if you want it personalized (of course you do!). You can add a nice sketch book to the bag and you are done. The Crayon Keeper is perfect for restaurant-distraction-action. Mamapicks readers receive 10% off on any order! Simply enter promo code: MAMAPICK at checkout. Valid until August 25th. The website and ordering process are made really simple but you can also order over the phone and make arrangements to pick-up your items. Amy, Rebecca and their staff are always sweet and eager to help. Peel & Stick Chalkboard Designs + Mamapicks Giveaway from Solo Para Ti! What kept us busy this past weekend? These amazing peel+stick chalkboards by Wallies from Solo Para Ti! You can peel and stick and reposition at any time. The package even comes with chalk. We created a beautiful design on our playroom wall AND one on an old side-table. For only $20, this makes for a great gift for any age. Plain rectangle styles available too! Solo Para Ti is a great home store in Richmond Hill owned by Allison who always has the greatest finds at competitive prices. If you need a special gift for any occasion and a convenient shopping experience, book an appointment to see her showroom which is open 7-days a week. While you browse, your kids can colour or watch TV on site. Gift cards are available and gift wrapping is complimentary! The website is but a small sample of what Solo Para Ti has to offer. Forget the hustle and bustle of the malls and make Solo Para Ti your go-to for all your gifting needs. Mamapicks readers receive 15% off any regular priced item until August 5th! …and now for the GIVEAWAY! Two lucky readers can win a $25 gift certificate for Solo Para Ti. Visit the website and drop me a line telling me which of Solo Para Ti’s products you would put on your wish-list. The first two people to write in win 🙂 Winners must be Mamapicks subscribers. Posted in Cool Products, Exclusive Discounts, Gifts, Useful Info. These beautiful ukuleles were our best find at the Lawrence Village Street Festival. We couldn’t walk past the display of all those colours without my son insisting on getting a blue “guitar”. Grandma was there to ensure that The Boy got what he wanted and of course, The Girl got a pink one. Since then, my little ones “play” their instruments and sing their repertoire of songs over and over again. What kid wouldn’t love a real + beautiful instrument of their own? Available in pink, blue, yellow, red, white and green (call ahead to see if your colour choice is in stock). They even come with their own carry bag! $31.99 each and the nice folks at Snider Music Centre on Yonge & Lawrence are giving Mamapicks readers 10% off! Just print this coupon and bring it along. And BTW, these ukes make for a really nice accent piece in a child’s room when they are not in use. Posted in Cool Products, Exclusive Discounts, Gifts. A warm afternoon. Husband comes home early so we can take the kids to the park. Picnic blanket, dinner, and fruit all ready for a family picnic on the grass. Kids play. We smile. We plop ourselves down on the blanket and begin to eat. Bliss. The Boy announces “I need to make a poop”. No toilet in sight. Husband grabs two kids and runs for the car. I frantically collect our things and run. We get home in the nick of time. I search the internet for future preventative measures. Posted in Cool Products, Deals, Exclusive Discounts, sale.